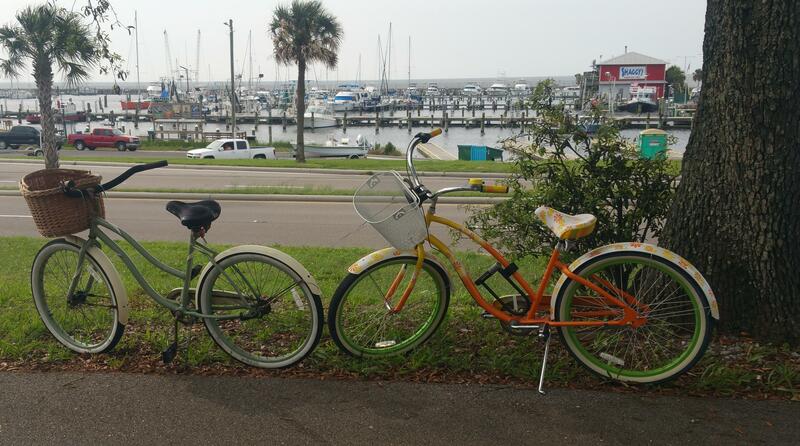 Stella and Daisy take a rest near Pass Christian Harbor in Mississippi. I feel as though I’m in a sort of suspended animation lately. Thad and I decided to take a few days off from The Zombie Company Crusade Series this spring so that he can concentrate on releasing the Zombie Company Crusade mobile game app and I can concentrate on my other writing and research projects. It’s been a rainy spring, but a lovely respite! I’ve spent time with family and taken time to read. I love being able to curl up with a book and just read. I’ve read all my newspapers every day and my magazines from cover to cover. In the last couple of weeks, I’ve read Orphan Train by Christina Baker Kline and Adultery by Paulo Coelho. Right now, I’m just diving into Love in the Time of Cholera by Gabriel Garcia Marquez. In two weeks, I’ve been to the rugged 1930’s era great plains of the United States tracing a harrowing, heartbreaking orphan’s journey, contemporary Geneva, Switzerland as a wife and mother struggles with her internal dissonance to save her marriage and her sanity, and Marquez is introducing me to early twentieth century colorful and romantic Caribbean. Great stuff! I’ve been riding my bicycle, lovingly named Daisy, with my neighbor Carole whose cruiser is named Stella. I’ve posted a couple of fun things about Stella and Daisy on my Facebook wall https://www.facebook.com/jodi.koszarek and I toy with the idea of creating a children’s book from those posts. We’ll see, though. They’re a lot of fun to write and those rides have helped center my mind and spirit so I can get back to writing. 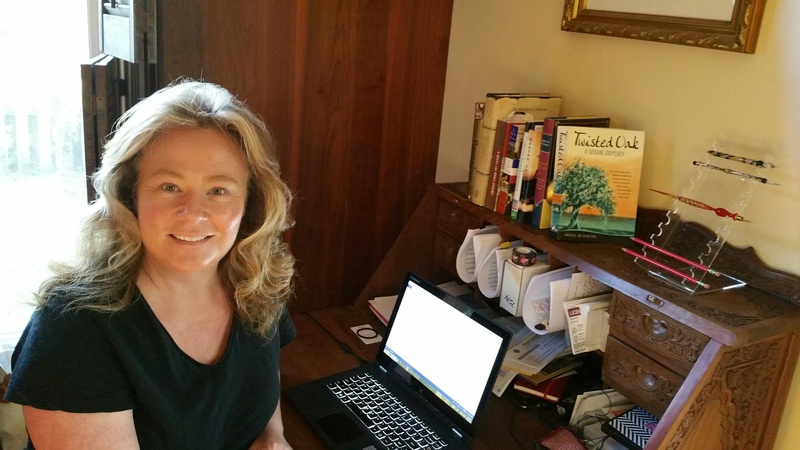 I am not a voracious tweeter, but you can also find me on Twitter at Jodi Koszarek@JLKoszarek1, but be forewarned. I am still trying to get the hang of Twitter! Thad is incredibly busy working the Zombie Company Crusade mobile game app and I encourage you to read his blog at http://www.thaddavid.com for updates and his amazing personal story. He is a remarkable man; a courageous young entrepreneur who, I think you will find interesting even outside of his creations. He and I have completed Divide Then Conquer, Book One of the Zombie Company Crusade Series and will soon offer preorder options tied in with the release of the mobile game app. We will keep you posted. Our projected start date for the Zombie Company Crusade Series Book Two is in June, so rest assured we have more adventures to offer. Please feel free to download parts 1-6 individually today and catch up before we begin releasing Book Two. Currently, Thad and I are discussing the possibility of creating hard copies of Divide Then Conquer, Book One of the Zombie Company Crusade Series for those of you who would like a collector’s edition. Please stay tuned on that bit of news as we review our budget and explore our options. My husband and I will begin preparing for our semi-annual migration to northern New Mexico over the coming weeks even as our gulf coastal engagement calendar keeps filling up with fun things we need to do before we leave. There are lots of things going on, but most of all, I’m surrounded by great friends, a loving family, and abundant natural beauty. I get to keep writing and reading, too! My passion is alive and well never faltering and for that, I am eternally grateful. Yesterday, Tony London, a childhood chum of mine posted a photograph of a church advertising “drive-thru prayer” on Facebook. Tony’s comments on this were a lament for living in a place and time where “instant gratification and technology are against the law.” OK, Tony, I’ll give you an “A” for hyperbole regarding the “against the law” part. You can’t really mean that where technology is concerned (? ), but “instant gratification”? I can dig having less of that and there is no doubt that technology brings “instant gratification” to a whole new destructive level. We all know how well our bodies have done with drive-thru food, now we have drive-thru prayers! Yea! Our spiritual lives can now be malnourished, too! Becoming cynical and snarky, I went outside to prune my roses and ponder the implications of drive-thru prayer. There is just too much going on here not to write about it. I’m not religious. I’ve honestly tried to be. I really have. You name it, I’ve probably tried it, but it hasn’t worked for me. I respect it all, and appreciate people’s choices and practices. If it’s good for them, it must be good for all of us. I like “goodness”. I’m sure the Pastor at the drive-thru prayer place is well intended. He, no doubt makes people feel good by offering this service. I wonder, though, about the intentions of the people participating in drive-thru prayer. What propels someone to pull off the road, go through a drive-thru and pray? How does it work? Do they have set hours or are they open 24 hours like Taco Bell? Is it like a thirty second Lord’s Prayer; put your dollar in the plate, and drive off kind of deal? I try to get passed the mechanics of it to explore the idea of intention, which another friend, Melinda Potter Bloom chimed in about and she is absolutely spot-on. If it’s all well-intended, then surely this is a good thing, right? I just can’t get around the mechanics of it, though because it is so surface oriented; so convenient. Where is the depth? Where is the meaning? Maybe this gets to why congregating to pray has never worked for me. I’ve never viewed prayer as something you do “on the surface”. I’ve participated in a lot of different kinds of group prayers and mostly they were quite mindless, at least for me; a monkey see, monkey do kind of thing. I just couldn’t dial into it. I’ve never viewed the concept of prayer through the idea of consumerism, or convenience, either, which brings me to my current literary project, the iconic classic symbol for mass, mindless, lazy, convenience driven consumerism, the zombie. 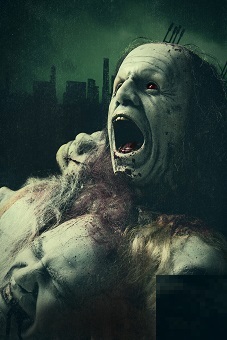 Please read the blog on Thad David’s, my collaborator, website for some more insight on this literary symbol: http://thaddavid.com/2015/03/11/zombies-without-prejudice/. These issues run deep. They’re personal and yet universal. I think of Joshua Blair, one of the main characters in Divide Then Conquer. He’s a young devout Christian with a huge personal secret. He’s handsome, educated and his community, Savannah Safe Zone is surrounded by zombies. Now, he is faced with having to come to terms with the concept of the spiritual zombie. He sees it in himself and witnesses it all around him. As his physical world crumbles, will Joshua be strong and honest enough in body as well as spirit to forge a new more authentic life for himself and awaken the spiritual zombies around him, or will he follow the spiritual zombie horde and remake what’s left of his world in the image of the time before the Zed invasion when spiritual zombies ruled? Martin Buber was born in Austria in 1878, he was over 60 years old when the German crack down on the Jews was at its worst. I often think of people like Martin Buber and his younger contemporaries like Viktor Frankl while writing Divide Then Conquer. Both men were Jewish and experienced a real apocalypse, the holocaust that shaped their thinking and life’s philosophies in very different extraordinary ways, which in turn, helped shape contemporary thought about the human condition in general. Divide Then Conquer, is apocalyptic fiction, but I never lose sight of those who suffered real ones, and so I guess my point is that I strive to respect them, and everyone else who has experienced a real form of apocalypse and there are so many kinds of apocalypses, aren’t there? Viktor Frankl in his book Man’s Search for Meaning said of his time in a Nazi concentration camp, “When a man finds that it is his destiny to suffer, he will have to accept his suffering as his task; his single unique task.” Such a noble statement! I am a character driven author, so once my character is introduced to his or her set of circumstances, they write their own story; their “single unique task”. I’m only the medium by which they tell it, so don’t hate me when one of my characters upsets you! Their behavior is their choice driven by their circumstances, not mine! And as humans, we are destined to upset one another. These days it seems like it truly is our “single unique task” to be angry, fearful and choose blame and denial instead of the hard work of acceptance and overcoming obstacles together. After many hours of working together, I have come to believe this may have been a central driving force behind Thad David’s inspiration for this story. This is where I draw on the works of Buber and especially Frankl. Their words, ideas, and actions help me create realistic characters. There is very little, if any, innocence in the apocalyptic land of basic survival. Wrapping Divide Then Conquer Part 5 got me to thinking about Albert Camus and his vast work surrounding the human conscience and moral philosophical issues to guide my thinking in understanding why my characters do the things they do. I want my characters to appear real to you, my reader. I want them to be people of conscience, awareness, selflessness, and selfishness. I want them to love, hate, create, and destroy, but most of all, I want them to live. If each of us creates our own meaning, as Frankl proposes, then the characters in Divide strive to do the same. They must find meaning to survive and as Martin Buber says, the secret destination is yet unknown to them. It is unknown to this writer as well.